My first RAK Occasions card! Kim created this gorgeous background on White Glossy Cardstock! Each one of these beauties warmed my heart and made my day so much brighter! This was my SECOND card from Kim during July... I was so excited!!! and it made me want to do this myself! and guessing what they are so I can attempt them myself. And yes, you see a THIRD card from Kim Fiore!!! 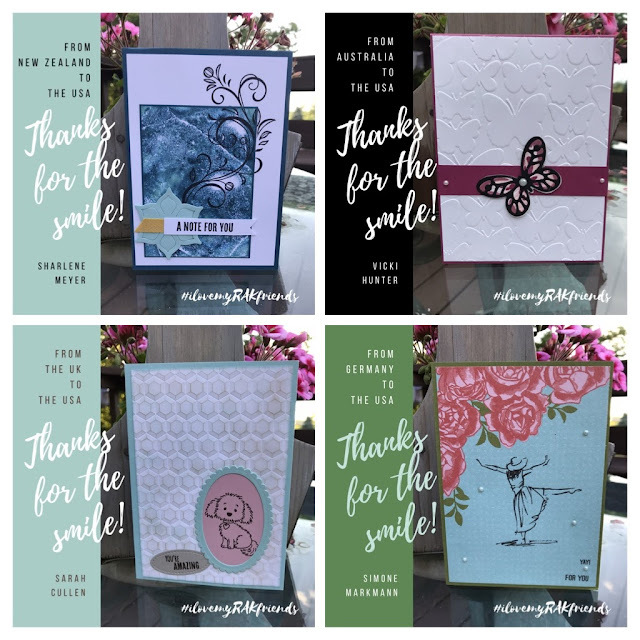 July was a busy month for me personally so I was not able to send out as many cards as I have in the past. That is what is so nice about this group... you can participate as little or as much as you can. Needless to say, I am looking forward to sending out lots more at my next opportunity! Carolina Evans' response when she saw my name on an envelope in her mail!!! So classic as I know my face and many others have looked the same way when they have received a RAK. Angie, you hit the mother load of RAK cards!!! Love seeing them all. How do you join the RAK group? I would love to participate. Thanks! Hi Lisa! Go to Facebook and search for Random Act of Kindness Card Group, click on request to join and answer the questions. We'd love to have you join us!